The economic benefit of Aberdeen FC's planned new stadium has been "grossly overstated", according to objectors who commissioned a new review. A report from an economic consultancy found the harm could outweigh the benefits, the BBC News website has learned. 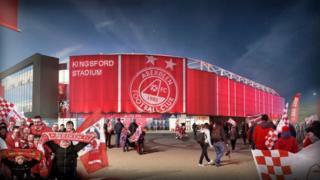 The club put plans for the £50m stadium and training facilities at Kingsford, near Westhill, on hold in October. A fresh public consultation was launched ahead of another hearing. The No Kingsford Stadium protest asked Stirling-based MKA Economics to look at documents related to the proposed relocation of the stadium presented by the club. Last month, a report by Aberdeen and Grampian Chamber of Commerce said the economic benefit of Aberdeen FC's planned new stadium could be greater than originally predicted. The club said the analysis showed the plans would create more than 440 construction jobs, and the stadium, sport and training facilities would bring millions of pounds into the economy. It also warned that crowd figures would suffer by not moving, and there was a risk of losing European football. However, No Kingsford Stadium (NKS) said the new review highlighted a potential risk to the economy as a result of construction and congestion caused by the stadium. The group said the Westhill and Kingswells area was already under pressure from population growth. NKS director Clare Davidson said the research for the club was "open to challenge", adding: "The economic case presented by AFC is flawed and the economic benefit is grossly overstated." The group wants the club to look elsewhere. Concerns have included traffic and parking issues. Raymond Edgar, Kingsford project director said: "The MKA report is interesting although the more important comment and review comes from expert economists within the council who are satisfied with the findings. "The methodologies used are compliant to HM Treasury guidelines and well understood. "This analysis stands up to scrutiny and demonstrates the net economic benefit of the new stadium complex, while exposing opportunity and risks. "The council asked us to consider further scenarios in our latest report and, under these scenarios and methods of calculation using all the information we have, the economic impact is greater, even in the most conservative scenario." The closing date for written representations on the fresh public consultation to be submitted to the council was on Tuesday. Another pre-determination hearing will be held in the new year. The original pre-determination hearing was held in September.